I am a completist. So even though everyone may be tired of hearing about making vintage ornament wreaths <– tutorial here, I need to do this story — about making these wreaths using new ornaments, instead of old. Some folks want to use new ornaments — because they cannot get their hot hands on the vintage… because they prefer not to shoot up their precious vintage ornies with hot glue… or because vintage is too costly. Making two wreaths using new ornaments, I discovered a fourth reason to try it with the new: To hone your skills. Strangely, perhaps, as I continue to make more wreaths (for friends and family), I am not finding it “easier” to make wreaths that please me 100% — I am finding it more difficult. Maybe I am getting pickier, or over-thinking it. In any case: Even if you have an innate talent for something, there is nothing like practice practice practice. And no question, it’s way less stressful — albeit, still not super cheap to practice on new ornaments! Read on for my tips on where to buy vintage-style ornaments new — and where to find the best prices. and (2) aqua, pink, silver, gold and blue. 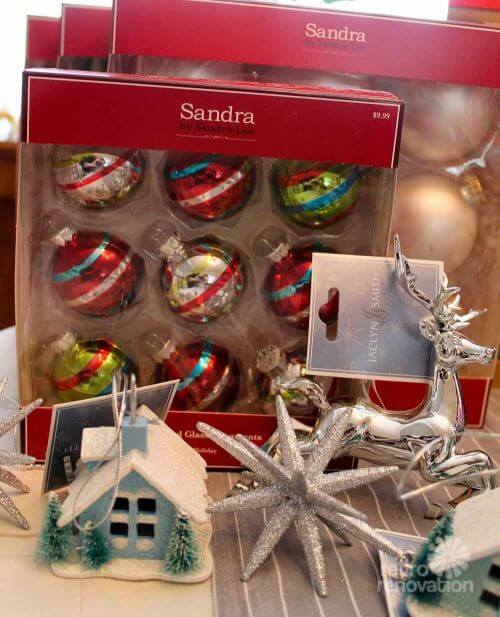 I chose these two color combinations after seeing and buying the vintage style ornaments at Target — shown above. Yes, Target has glommed onto the retro Santa’s sled more than any other retailer I was able to spot, and this season, has sets of ornaments that mimic vintage Shiny Brites. The sets come in the red/green or pink/aqua color sets (more or less). 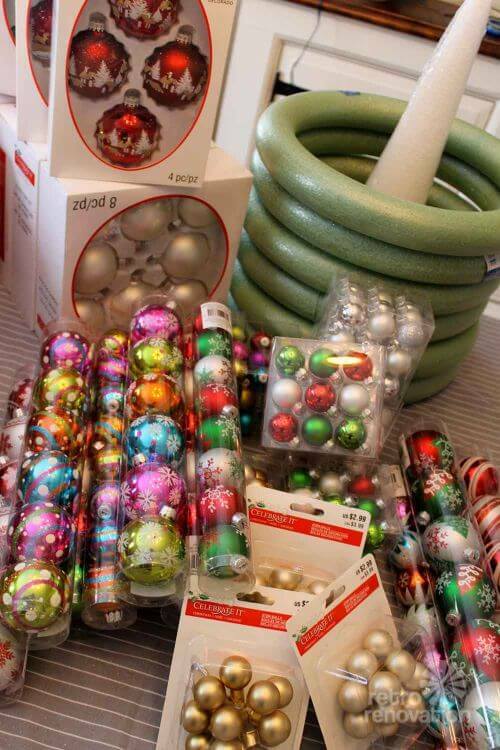 #2 — Big Lots (above): For 2.5″ balls to circle the outside of your wreath form, I found that Big Lots generally had the best deal. 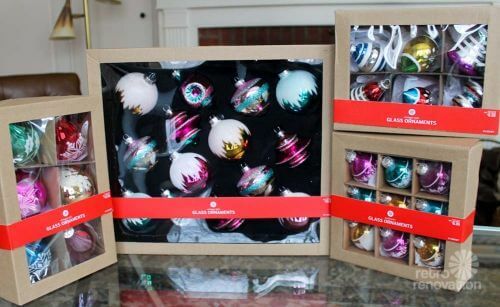 You could get 15 @ 2.5″ ornaments for $5 (before any sales). There were similar el-cheapo deals on smaller — including 1″ diameter — ornaments in a variety of colors — some with little flocked designs even. When you are making ornament wreaths, it is super good to have itsy ornaments like the one-inchers (and even smaller) on hand. TIP: Both Kate and I agreed that we tended to favor filling in gaps on our wreaths with small balls in silver (especially) and gold on all our wreaths — these lighten up the wreath and sort of help your eye dance all around it. 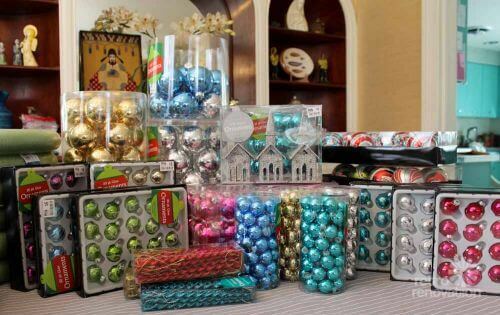 If you want to save money, focus on acquiring the silver and gold itsy balls — at Big Lots, you could buy 54 for $5!. Of course, having some color one-inchers on hand is nice, too, to add dimension and pop. 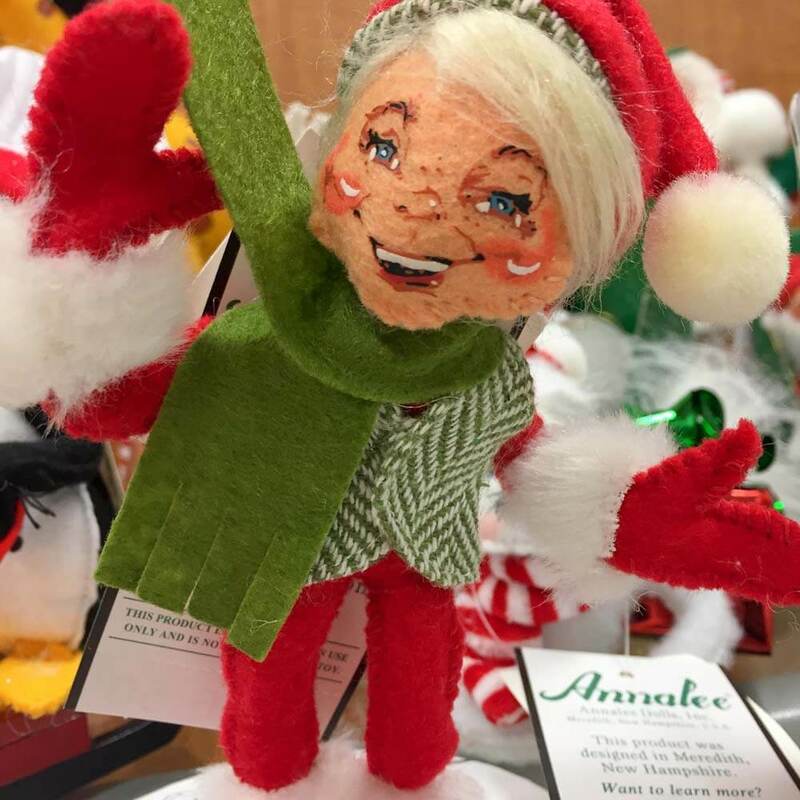 #3 — Michael’s (above): Michael’s has a lot of ornament diversity — and started having sales pretty early in December, which made their generally-higher prices more palatable. Note, I loved their selection of decorative ornaments — flocked! — for the front of the wreath; Michael’s was definitely the best source for decoratives to complement the Target Shiny Brites. 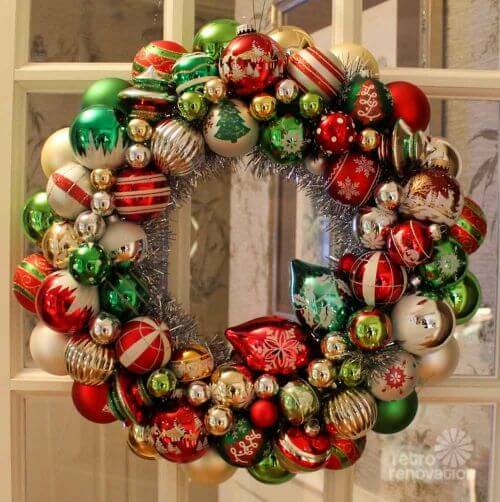 I love Michael’s red-white, green-white and red-green-white ornaments in particular — I’ve become a huge fan of the green/red/silver/white/gold wreath combination — a real crowd-pleaser. Michael’s also had a good selection of 2.5″ balls for the outside in colors beyond those available at Big Lots. Finally, #4 — K-Mart (above): K-Mart also was good for colors for the outside rounds, particularly in the Sandra Lee collection. For ornie bling, I also loved the faux-chrome-plated plastic stag — just like the vintage one, only it’s a bit bigger. Decide on a focused colorway — and collect narrowly in that colorway. 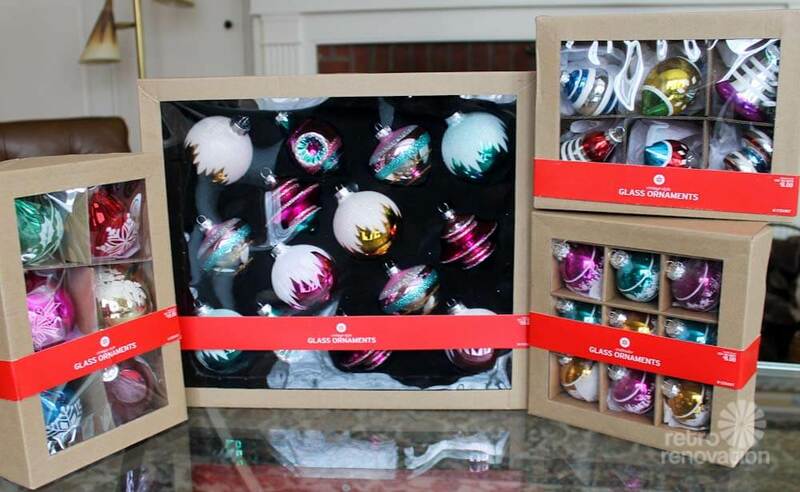 Start with Target… then Big Lots, and check out Michael’s, too, especially if you can get ornaments on sale. 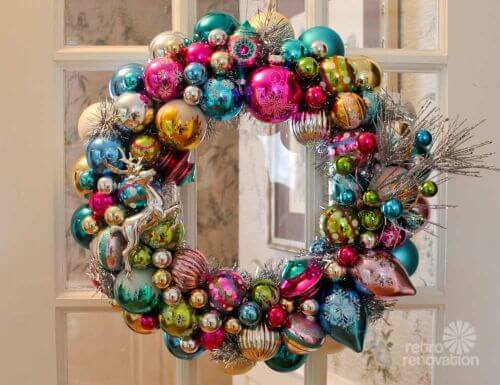 For the outside ring of a 14″ foam wreath, you will need 20 @ 2.5″ round ornaments. Kate and I then counted we each use AT LEAST 24 ornaments for the top of the wreath. In this wreaths featured in this story, I used 38 top-ornaments on my red/green wreath above… and 35 ornaments on my pink/blue wreath… the number you use depends on the size of these top ornaments and also the size of your weebits and how how you fit the top ornaments around your weebits. Finally, we have found that up to 30 smalls to fill in; you could use more or less. The more ornaments you have to work with for the front of that wreath, the ‘easier’ it will be to create a pleasing design. This is work — there are now lots of photos of ornament wreaths online — study these photos for design ideas, don’t just jump into a hot glue frenzy. 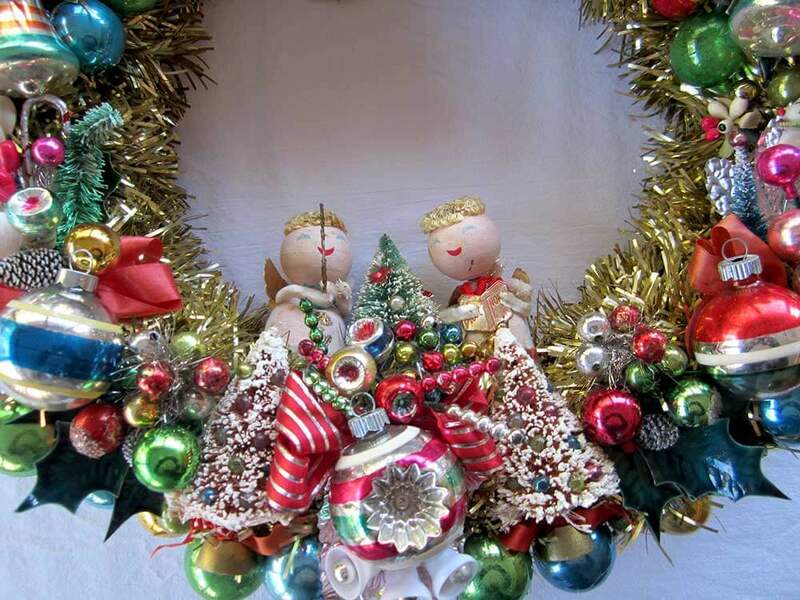 In addition – you need kitschy weebits like the stag, or small Santas, or floral picks or whatever to work into your wreath. I tend to think: At least three focal points on the front of the wreath, I like doing one at about 2 o’clock, one at 5 o’clock and a third (‘heavier’ / good feng shui) one on the left about 9 o’clock. I did not try to “age” my new ornaments. Maybe someday I will do these. Meanwhile, I will just try… using them for 25 years. That should do it. All this said, I could not get this story published fast enough — because I was back at Michael’s the other day, and they are already so discounted that they are running low on stock. In addition, good luck getting a wreath form. The shelves are wiped clean in my town. Ack. Next year, I will be sure to get all my stock well in advance. In fact, if you are making multiple wreaths, it may be smarter to buy in bulk from Amazon or other online retailers, where you can save a goodly chunk of dough re mi. 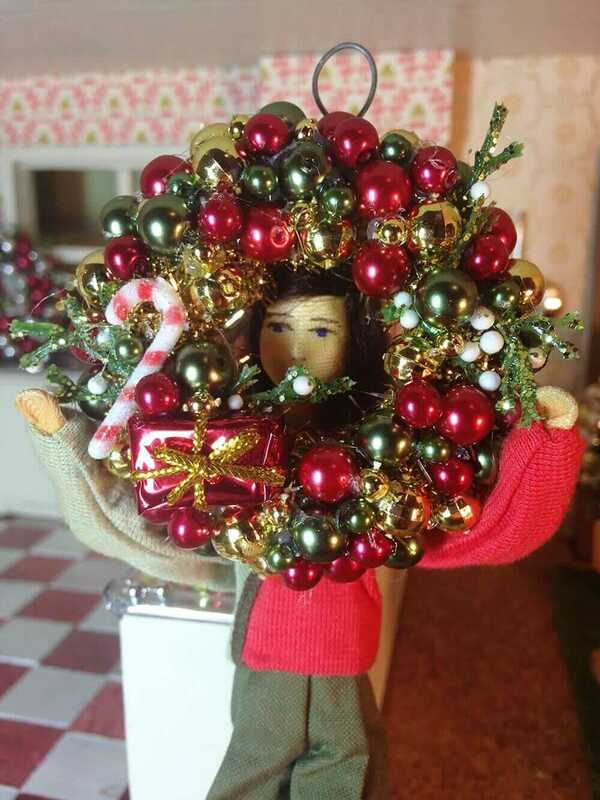 April makes a wreath using 10 vintage Christmas corsages — gorgeous! Making Christmas ornament wreaths — for the dollhouse! 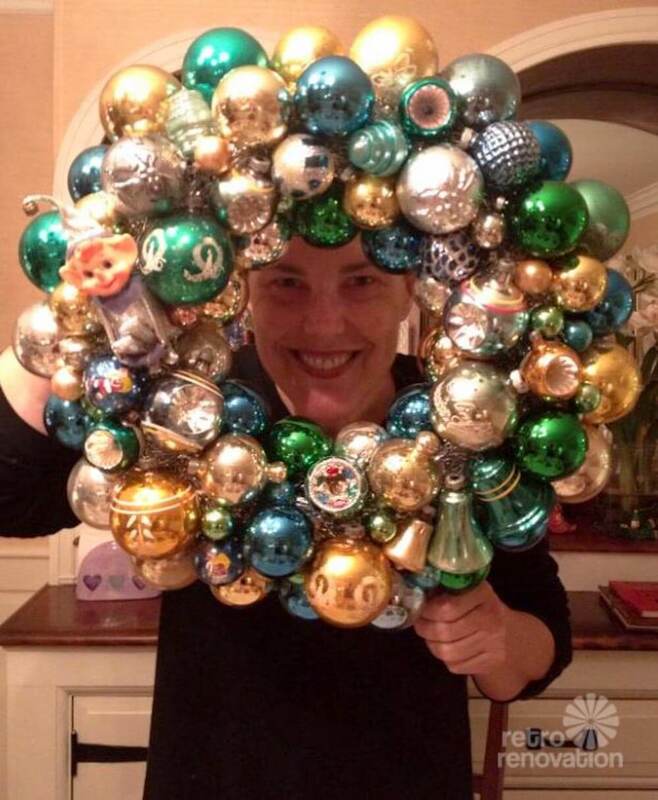 Pam, I am a huge fan of these wreaths! I need to make six large wreaths and vintage is cost prohibitive. 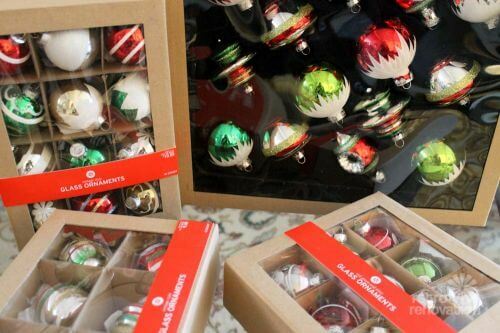 I have started collecting new vintage-style ornaments to get started but I am having difficulties finding smaller sized glass balls. Do you use plastic/shatterproof balls or strictly glass? Your Target, Michaels, Big Lots photos look like plastic may be mixed in but it does not specify. Please let me know your thoughts. Thank you! I usually use just glass. There are some vintage ornaments that were plastic, and I have used those too. One thought: High heat may melt the plastic – probably smart to test before you buy a gazillion. The retro pink rein dear armaments that’s sold out from Target last year are now once again available on their website. Go to Target’s website and type reindeer ornaments in their search engine.